I wish Organization Skills 101 was part of the standard school curriculum. Learning how to organize school papers, books, schedules and supplies has a lifelong positive impact. For homework–the Homework Organizer is designed to hang on a door (it’s 28 inches wide by 36 inches high, to fit a standard door frame) or wall with two removable adhesive hooks. It features four legal-size pockets with insertable labels for organizing papers and schoolbooks; two clear pockets for small supplies such as pens, pencils, glue sticks,etc. ; a dry-erase calendar so you and your child can note after-school activities and assignment due dates; a small pocket for housing the included dry ease marker; a large clear pocket for displaying a lunch menu or sports schedule; and two Velcro straps at the bottom for poster board project storage. It’s available in three color combinations. attaches to doors with a stretch strap; it includes eight hooks that are fully adjustable up or down. For lockers–the Adjustable Double Locker Shelf features two shelves that can be installed at various heights and a pull-out drawer for school supplies and personal items. 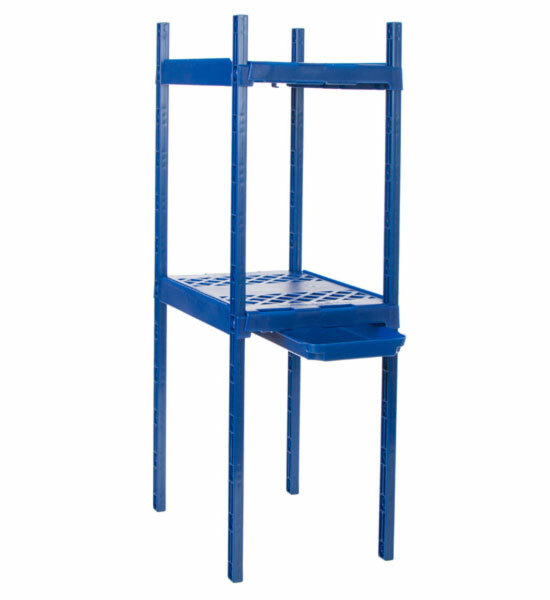 It fits in locker spaces measuring 9 inches to 12 inches wide and stands approximately 24 inches high, so it’s best used in taller locker spaces. More types of locker organizers can be found here and in my post about locker organizers.